While primarily designed to protect the eyes from the harmful sunrays, sunglasses can be an invaluable item in any woman’s wardrobe. After all, they are also able to complement their sense of style or, on the contrary, completely break the impression. That’s why you need to be really picky when looking for the best sunglasses for your girlfriend. And we are here to help you with it today! We have picked 10 models to showcase, and each of them is unique in its own way. We even think that any woman could find what she looks for in our material! Without any further ado, let’s try to find the perfect sunglasses for your girlfriend! Know that your girlfriend loves Aviator-style sunglasses? If so, then you may want to get these Oakley Women’s sunglasses. In terms of design, they look like any Aviator sunglasses, but this isn’t a bad thing. That style is rather simple yet highly expressive. While having no fancy design features, these glasses can still be some great eye catchers. The particular model we based our review on has a rose gold color scheme, but there are several other colors to choose from as well. If the rose gold sunglasses seem not enough flashy for you, then you could go for the gold & jade iridium glasses. Or maybe your girlfriend would like the polished black version more. Oakley was originally created for world-class athletes, and Oakley Feedback glasses bear this tradition in them. Its snug and comfy head wrap is designed to ensure proper fit for active women. If your girlfriend happens to be an athlete or just like to work out outdoors, then she will surely appreciate the comfort these sunglasses bring. Unlike cheaper sunglasses, Oakley Feedback is designed to enhance the details seen through its plastic lenses. Oakley’s Prizm technology fine tunes individual colors in order to deliver a vivid image. The lenses not only deliver vibrant colors but also protect the eyes thanks to their 100% UV protection coating. After all, these are sunglasses, and they need to protect your eyes, not only look good on you. And besides, they are polarized to reduce the glare that can significantly limit visibility! For women who love vintage items, Sungait sunglasses will probably be a better choice than Oakley Feedback. 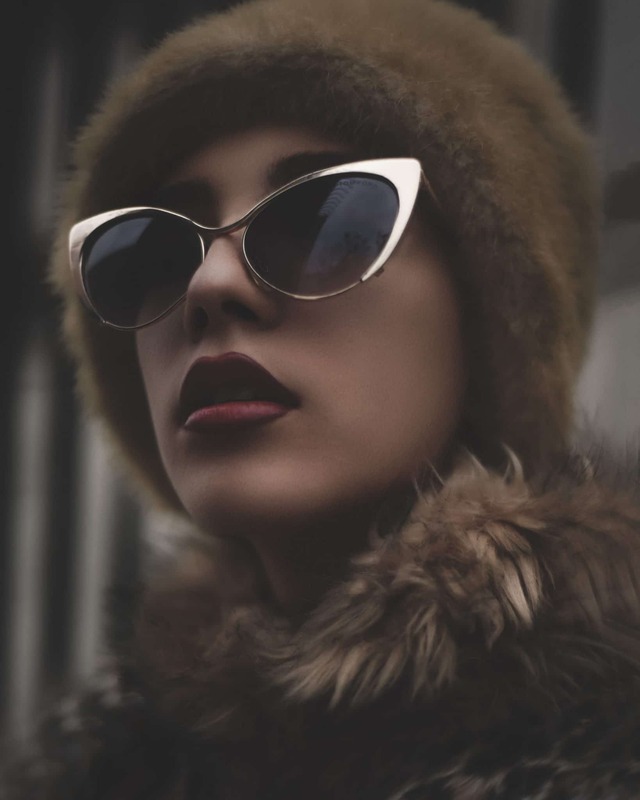 With their vintage design, these sunglasses will be able to complement more restrained clothing styles. And that’s no matter what colors your girlfriend prefers to wear since Sungait offers several color options for their sunglasses! Another thing that you personally may like is that these sunglasses are very inexpensive. Sungait vintage-style glasses thereby make for a great low-budget gift. Needless to say, you can’t expect these sunglasses to be as good as something like the pricey Oakley Feedback, but they still do have a couple of interesting features to offer. First comes protection. The composite UV400 lenses are designed to block all the harmful UVs, at the same time maintaining true colors as closely as possible. Your girlfriend may also like the fact that this particular model isn’t polarized. While they won’t be able to block glare very effectively, they will deliver greater detail in environments where it matters more than glare reduction. You could get a polarized version if she needs it though. And there also are mirrored and non-mirrored versions available. And lastly, the lenses of these sunglasses are made shatterproof, so your girlfriend could be confident that these glasses will last for a good time. The frame of the Sungait sunglasses is also remarkable. Lightweight and durable, it is designed to never fade under sunlight. In the end, Sungait sunglasses look really spectacular, in spite of their inexpensiveness. If your girlfriend finds that her face gets overwhelmed with larger sunglasses, then the sleek and low-profile Maui Jim Stingray sunglasses may be of great interest to you. And to her, of course. The first thing that catches the eye in these glasses in comparison with the previous two is its lower lenses. These glasses are more compact, which may be a thing that is better for your girlfriend. The frame of these glasses boasts a tough cellulose build, a saddle-style fixed bridge with nose pads, and anti-corrosive spring hinges to ensure comfort and durability. However, the frame is the least interesting thing in these glasses, in our opinion. The model we based our review on has a tortoise frame and HCL bronze lens. Aside from looking very interesting, this color combination can suit many clothing color schemes. But if your girlfriend would like something simpler, then you could go for the much more restrained gloss black version. And yeah, there are only two colors schemes for these glasses to choose from, so there isn’t much to look for. But if you like either of them, then you won’t need any other colors. The lenses of Maui Jim Stingray sunglasses are polarized with PolarizedPlus2 coating to ensure both protection from glare and color enhancement. Needless to say, these glasses also have great UV protection. The HCL bronze lenses of the Stingray sunglasses deliver a pleasant warm tint that is great in changing light conditions. At the same time, the black version features grey-tinted lenses that are much better at light reduction in bright and even direct sunlight. Interestingly, the lenses are made very thin to ensure excellent clarity while maintaining UV protection. The lenses are waterproof and oleophobic as well, so they could be very well used when boating. The polarized coating that we already mentioned and its anti-reflective properties again make the Stingray sunglasses great for water activities. The bi-gradient mirror applied to the bottom and top of the lenses also reduces the brightest light coming from above and below. In a sense, the glasses squint for you, allowing your eyes to relax. And lastly, the lens is shatter- and scratch-resistant, so your girlfriend could expect a long service from these sunglasses. These glasses are very much like Maui Jim Stingray sunglasses, but they have something else to offer. First off, these glasses are made in the extremely popular Aviator style. In terms of design, these sunglasses are pretty much identical to Oakley Feedback we examined in the very beginning, but there are a couple of features that may interest you in these glasses more. The main feature that differentiates these Maui Jim sunglasses from the Stingray model is the frame. The proprietary MauiFlex frames are designed to remember the fit and shape of the wearer’s head longer than tradition metal frames. You could thereby say that these glasses have some kind of a memory effect in them. Wearing them in pretty much any kind of activity should be very convenient. When it comes to the lenses, they are pretty much identical to the one in the Stingray model. And this means that you’ll be getting some spectacular protection and clarity with these glasses. As you probably remember, the lens of Stingray had fancy and useful features like waterproof and oleophobic coating, the PolarizedPlus2 technology that was also present in the Stingray, and the bi-gradient mirror shielding the eyes from below and above. The lenses are again made super thin to ensure closer to natural colors. And they are also shatter- and scratch-resistant. Maui Jim offers these sunglasses in three colors: silver, gloss black, and metallic gloss copper. They all look beautiful, but your girlfriend will probably like one of them more than the others. If you know that all those sleek glasses won’t cause a spark in your girlfriend, then something like Ralph Lauren Women’s sunglasses may be the thing that you are looking for. These glasses have a fatter frame design than the Aviator-style sunglasses we reviewed, but this doesn’t make them look ugly. On the contrary, they could be better for a wide range of clothing styles and situations. As we feel it, these glasses would look great on a woman who prefers to wear a suit. And besides, these glasses would perfectly complement any reserved apparel. Since there was only one color option sold on Amazon at the moment of this review’s writing – black – there will be a certain limit to what apparel colors your girlfriend may be able to combine these sunglasses with. But no one limits her, so she could wear these glasses with whatever clothing she wants! This is how the design of these glasses goes, but what about their comfort and protection? Well, Ralph Lauren glasses certainly have a couple of things to boast, but not as many as, for example, Maui Jim sunglasses. The lenses of these glasses are made from glass, which may make them heavier than sunglasses that have plastic lenses. The lenses are scratch-resistant and durable, which is a thing that you’d want from glass lenses. The lens is coated with anti-reflective treatments to increase their clarity. On the other hand, the lenses aren’t polarized, so a certain amount of glare may still go through them. This won’t be a problem though if your girlfriend won’t be wearing them near water, as an example. The lenses also provide 100% UV protection, as you may expect. As for the frame of these sunglasses, they are made from a combination of titanium, stainless steel, and cellulose acetate, which imparts both excellent durability and lightness to these glasses. In the end, you get durable, stylish, and comfy glasses all in one! We know what you may be thinking. You are here for sunglasses for your girlfriend, and you might be wondering why we feature men’s sunglasses on our list. While these glasses are sold as men’s glasses, their design doesn’t limit them to just men. Not all women will like such sunglasses, but those who prefer to wear more serious-looking and less flashy glasses will most likely like the Thinklink sunglasses. These glasses feel very much like the Ralph Lauren sunglasses we’ve just reviewed in that they are both more suitable for reserved clothing styles. Thinklink glasses put that sense of seriousness a bit further with its shape that has more sharp edges and angles in it. In terms of comfort, these glasses are very close to the Oakley Feedback sunglasses we reviewed in the very beginning. Oakley traditionally makes glasses for active lifestyles, after all. Now, this doesn’t mean that these glasses won’t be a good pick for your girlfriend if she doesn’t like physical activity that much! With the frame inspired from the sporty Oakley Crosslink glasses, Thinklink has a comfortable and secure fit to offer. While not as active-oriented as the Crosslink, these glasses still are versatile enough to be able to keep up with active lifestyles. Out of the box, Thinklink sunglasses come with polarized and UV-protective coating, which makes them great for various conditions. The lenses are prescription-ready, so if your girlfriend needs it, she could swap the lenses for something more suitable for her. What you may also like about these glasses is that there are over a dozen color options for the lenses and frames for them. This could allow you to lighten up the reserved design of these glasses a bit! Now, these are some beautiful Aviator-style sunglasses. We’ve reviewed several such sunglasses today, but none of them is as unique as these ones. While made in the Aviator style, there is something different in these glasses’ design. Thanks to the more teardrop-like lenses and the curved brow bar, the Baby Beach sunglasses look much more feminine. This effect gets even stronger with the rose gold color, which is a perfect option for women. Well, as far as their style allows them to wear sunglasses with pink lenses. Even if it doesn’t, you could opt for the more restrained gold and silver Baby Beach sunglasses. In total, there are 3 color options: not that many, but one of them may be the very best pair of sunglasses for your girlfriend! Produced by Maui Jim, the Baby Beach glasses have the traditional features of Maui Jim sunglasses. Sure, these glasses don’t have a MauiFlex frame that remembers the shape of the head, but they still have traditionally great lenses to boast! The rose gold version of these glasses has lenses that provide a subtle rose tint with a high contrast. As Maui Jim claims, the rose tint is perfect for use in fast-moving sports. The lens also features the PolarizedPlus2 technology that not only shields the eyes from glare and UV rays but also enhances clarity. To ensure strain-free wearing, the Baby Beach sunglasses – just like the other Maui Jim glasses we reviewed – has a bi-gradient mirror coating on the top and the bottom of the lens that keeps the eyes free from stress. And the lens is the same in terms of durability: it is waterproof and oleophobic, as well as scratch- and shatter-resistant, which is just perfect for these sport-oriented sunglasses. Yet another model of men’s sunglasses that can look very well on women! In fact, this model looks much more like women’s glasses than Oakley Thinklink we examined a bit earlier. Well, have a look at them. While Maui Jim markets the Peahi as men’s sunglasses, we think that women can wear them confidently as well. To be fair, to us, these glasses look like women’s glasses much more than men’s glasses. Rather restrained in design, Peahi glasses feel and look very feminine. With a slight stern touch in its shape, the Peahi glasses can emphasize confidence and dominance in women, which may be a thing that business ladies or managers need. Maui Jim offers 3 color options for these sunglasses: burgundy tortoise frame/HCL bronze lens, gloss black/neutral gray lens, and matte black/blue Hawaii lens. We like the deep blue color of the latter very much, but maybe your girlfriend finds the other colors more interesting. Now, we have reviewed several Maui Jim sunglasses before. So guess what the Peahi glasses have? You guessed it right, they have the crisp and protective lenses that are inseparable from Maui Jim sunglasses. Not that this is a bad thing. You want your sunglasses to be protective and durable, right? And Maui Jim ensures that Peahi delivers just as good as their other sunglasses. As a recap, Maui Jim Peahi’s lenses are waterproof & oleophobic, anti-reflective, scratch- and shatter-resistant, and have Maui Jim’s bi-gradient mirror coating. And yeah, they are also polarized! Some women may love these sunglasses. Others may absolutely hate their unusual design. But one thing is clear: these sunglasses do look spectacular and unique. If your girlfriend happens to have plenty of unusual items in her wardrobe, then Joopin semi-rimless sunglasses will interest you. In addition, these sunglasses are really inexpensive! These glasses do substantially differ from others in terms of design, so we feel that we should leave the assessment of its beauty to you. It’s a very delicate and subjective thing after all. Instead, let us focus on things more material. In particular, on the lenses of these glasses. Joopin stuffed 9 layers into the lenses of their sunglasses, with each performing its own thing starting from water & oil protection on the outer layers and ending with reflection prevention. In addition, Joopin sunglasses’ lenses are polarized to considerably reduce the visible glare and increase the clarity of the glasses. And, needless to say, the lenses have full protection against harmful UVA & UVB rays. To ensure comfort of wearing, Joopin equipped these sunglasses with comfy nose pads and anti-slip temples. In the end, you get sunglasses that are both comfortable and durable. A thing that will probably interest you as well in these glasses is that there are around 15 color options available for them. These sunglasses look remarkable as they are, but you could make them look even more catchy if you pick the right color! Closing off our reviews with yet another inexpensive model of sunglasses! These ones are a bit different than the others. LianSan women’s sunglasses have been specifically designed oversized, unlike all the other glasses we reviewed. If such a design happens to be the thing that your girlfriend likes, then she will probably like these sunglasses. In terms of the feel, these sunglasses are neither too flashy nor too restrained. They are somewhere in the middle, so women who like either unusual or very serious sunglasses will probably dislike them. But those who just would like to have sunglasses that can be worn with pretty much any clothing will most likely love the so to say balanced design of these sunglasses. LianSan sunglasses are also pretty remarkable when it comes to practicality. And it is not only because they can protect the eyes from UV rays, which any sunglasses should do. Because of their large size, these sunglasses can effectively block sunrays coming from below, above, and from the sides. With smaller glasses, one would feel restricted since even a slight turn of the head could expose the eyes to the light bypassing the small lenses. With larger glasses, this happens much rarer. Thereby, we think that these glasses are perfect for wearing in bright or direct sunlight conditions. In particular, they could be great for sunbathing! These glasses are also complemented with the polarizing coating of the lenses, which further increases their convenience under the sun. Thanks to the plastic frame and lenses, these sunglasses are very lightweight. On the other hand, they are also very delicate, so your girlfriend will need to be extra careful with them. To help your girlfriend accentuate her sense of style even better, you have numerous color options to choose from. Just make sure to pick a color that will perfectly fit the items in her wardrobe! Are you looking for new Sunglasses but have no clue which one you should buy? We created a list with the The Sunglasses to buy yourself or your Girlfriend.